This is a revelation. Susan Boyle and Peter Kay singing ‘I Know Him So Well’ from the musical Chess by Benny, Bjorn and Tim Rice. Thanks to Graham Soult for bringing this to my attention. 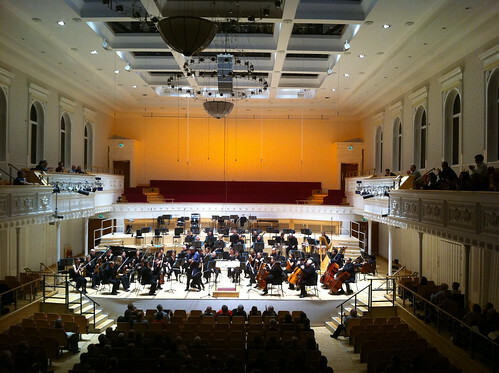 This was the first time I’d heard the BBC Scottish Symphony Orchestra play on home-turf at the City Halls in Glasgow. It didn’t disappoint. City Halls’s brilliant acoustic amplified the band’s fine string playing and also highlighted a demanding night for the brass in what was a long but nonetheless value for money gig – it was around about 10.00pm by the time we exited auditorium. Siblelius’ writing in the tone poem The Wood Nymph (1894) has some spectacular moments. A rich, complex orchestration of multi-layered melodies which build to successive climaxes, at one point quickly followed by an exquisitely tranquil movement of the kind you didn’t realise you needed but were damn glad had arrived. Sibelius effortlessly broadcasts hope and positivity with a pin sharp brilliance kind of writing for brass and high strings. Everything must have shimmered and glinted in the composer’s life, or maybe that’s what he hoped. It’s infectious. Just a shame that every now and again I was brought crashing into moments of reality when the same rhythmic figure which forms the opening melody of the Karelia Suite reminded me of painful school band rehearsals when junior orchestra would plough their way through the music with all manner of recorders, keyboards and whatever brass instruments could be found. Sometimes there should be a global ban on some music, just to save ourselves. Trumpeter Hakan Hardenberger took to the stage with a near-perfect performance of Haydn’s trumpet concerto. And whilst I wasn’t absolutely convinced about whether or not Birtwistle’s Endless Parade was more of an exercise than true brilliance, Bartok’s lush string writing in his Music for Strings, Percussion and Celesta rounded off the evening on an unexpected high. The concert is being broadcast on BBC Radio 3 at some point. No one knows exactly when however. Sad news about conductor Yakov Kreizberg whose death at the age of 51 was announced earlier this evening. Conductors are leaders. They steer the ship. And on that basis, they should also be the last ones to leave the ship if it sinks. They should also be ruggedly handsome. Kreizberg undoubtedly achieved three of these. The last remaining one would have been a little tough. Kreizberg featured at the BBC Proms over a ten year period from 1998 conducting the BBC Symphony Orchestra, Australian Youth Orchestra, Netherlands Philharmonic and the Bournemouth Symphony Orchestra. Far too young to go. Much missed. Where are the women composers? I’ve started podcasting again. I’ve missed it. What follows is the first splash around in the podcasting paddling pool I’ve done for nearly five years. There are some women composers, obviously. But why is it so difficult to name them? I spoke to Vanessa Reed from PRS for Music Foundation, Rachel Millward from Birds Eye View and composer and music educator Kerry Andrew. For further information about the recently launched funding scheme for women composers mentioned in the interview visit www.prsformusicfoundation/women. Many thanks to Tweep AlanTShearer for his sterling assistance with the sting. It’s a rare thing when you hear someone ranting in favour of the BBC. Even rarer when you hear someone ranting about the BBC on a competing network. God Bless David Mitchell on the 10 ‘o Clock Live show last night. We love you. We do. We love you. :: It seems that somewhere between the point of posting this and me tweeting it, the video embed failed. The video on the Channel 4 website seems to work. So take a short hop over there to see it if the embed doesn’t work.